We are pleased to announce that Seeding Labs received 67 applications from scientists in 25 countries for Instrumental Access 2015, our flagship lab equipment program. Instrumental Access provides high-quality scientific instruments and supplies to university departments in developing countries around the world at significantly reduced costs. Seeding Labs staff, along with a panel of qualified scientific reviewers, will now begin an extensive process to assess applications. An official announcement of 2015 awardees is expected in early 2016. This cohort of applicants presents a unique picture of scientific need in developing countries, filling a need for information about the state of global science. Among this year’s applicants were university departments from all areas of the developing world, including Morocco, Papua New Guinea, Peru, Bangladesh, and Malawi. Ten new countries applied to Instrumental Access, including Colombia, Mozambique, and Pakistan. 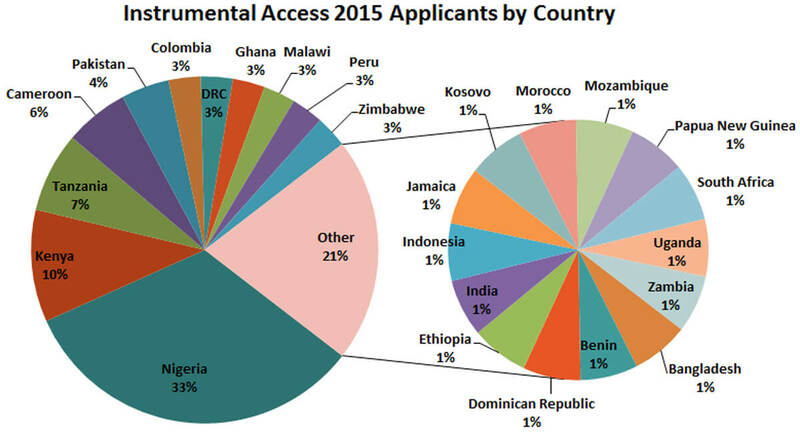 The Sub-Saharan African region produced 79% of 2015 applications, with Nigeria responsible for one-third of those applications. In the Instrumental Access application, we ask prospective equipment recipients to share a specific research area in which the new equipment would be a critical asset. Among 22 research areas, the most common answers included drug discovery and development, nutrition, and food safety. These three research topics were represented on more than half of the applications and are especially relevant, given that they are each scientific frontiers in which research conducted regionally can have far greater impact globally. The most common areas of academic discipline were biology, chemistry, and health sciences/medicine, representing an accurate cross-section of the scientists Seeding Labs serves. 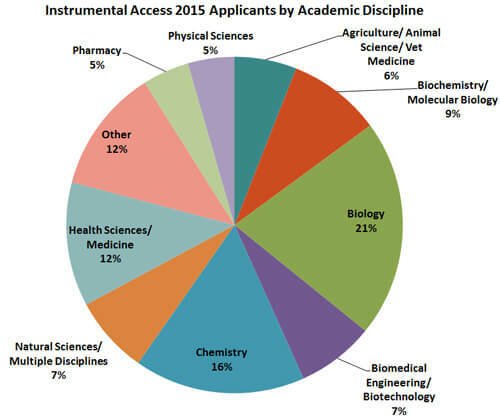 This year, Instrumental Access drew a large number of applications from young research departments, with 63% of institutions founded after 1999 and 24% after 2010. Young departments in developing countries often have the physical lab facilities required for the hands-on training that is essential to science education but lack the equipment to effectively deliver practical instruction to students. The Instrumental Access application process ensures that awardees have immense potential to further develop, accelerate, and bolster teaching and research efforts, while also confirming that recipients have sufficient infrastructure and capacity to set up, calibrate, and maintain equipment. To meet the equipment needs outlined in Instrumental Access applications, we source donations of new and surplus lab equipment, instruments, and supplies from pharmaceutical, biotechnology, and manufacturing corporations. These donations will make it possible for us to award 15 to 17 equipment shipments to university departments from the 2015 cohort of applications. 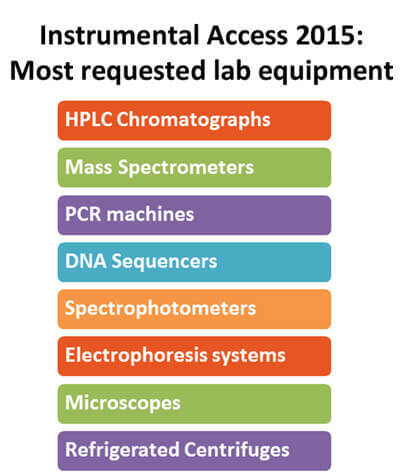 The most frequently requested equipment from this year’s applicants include HPLC stacks, DNA sequencers, and spectrophotometers. These pieces of equipment are relatively common in the labs of developed settings but are often inaccessible in emerging regions of the globe with developing scientific infrastructure. While Instrumental Access applications have closed for university departments, equipment donation is a year-round need for Seeding Labs. Individuals, corporations, and manufacturers interested in learning more about donating equipment, funds, or time to Seeding Labs can visit our Donate Equipment page or email us at equipment@seedinglabs.org.